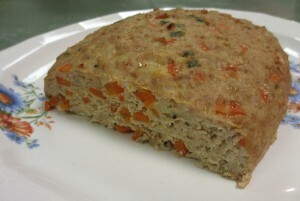 Meatloaf is often made of beef, veal, and/or pork, but I always make meatloaf with extra lean turkey. Contrary to what some people believe, a meatloaf made with super lean meat can be tasty and moist! 1. Heat oil in a large frying pan over high heat. Add carrots, onion, garlic, and salt. Reduce heat to medium and cook, stirring occasionally, for about 15 minutes. Transfer mixture to a small bowl; mix in a pinch of thyme (optional), pieces of bread, milk, and parsley. Place bowl in the refrigerator for at least an hour to allow bread to soak up the milk and flavors. 2. Preheat oven to 375°F. In a large bowl, add turkey, soy sauce, grated cheese, egg, bread crumbs, and refrigerated carrot-bread mixture. With clean hands, lightly mix ingredients until combined. Add turkey mixture to a greased 8×8 inch square pan and form into a 6×8 inch loaf . Bake for about 55 minutes or until a thermometer inserted into meatloaf registers 165°F. Fast food doesn’t have to come from a restaurant. 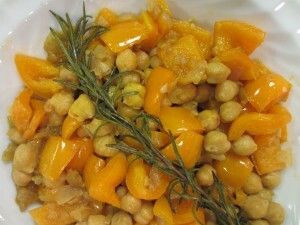 Rosemary Chickpeas and Bell Peppers is a dish that requires little prep time and cooks up in less than 20 minutes. It’s a great vegetarian recipe that I usually enjoy with polenta or brown rice. Heat 1 Tbsp. olive oil in a large frying pan over medium heat. Add onion, rosemary sprig, and ¼ tsp. kosher salt and cook for about 3 minutes. Mix in garlic and cook for 1 minute. Add peppers, chickpeas, and ¼ tsp. kosher salt and cook covered for 5 minutes. Uncover and cook for an additional 6 minutes. Add white wine, scrape up brown bits from the bottom of the pan, and cook for 2 more minutes or until peppers are cooked. Add pepper to taste, adjust salt as needed, and drizzle with 1 tsp. olive oil before serving. Note: You may have heard that plant-based proteins (beans, nuts, seeds, bread, cereal, pasta, and rice), except for soy beans, are “incomplete proteins”. This means that they lack one or more of the nine essential amino acids that our body cannot produce on its own. To complete “incomplete proteins”, make sure to consume a variety of protein sources throughout the day. For instance, rosemary chickpeas at lunch can be complemented by rice at dinner.